Solar Sister taps into the largest untapped source of renewable energy in the world - women power. We envision a brighter world powered by women entrepreneurs. We provide African women with economic opportunity, training, market access and peer support to earn a livelihood by delivering life transforming clean energy access to the most underserved last mile communities. Rooted in local women’s enterprise and the proven power of social trust networks, our innovation creates a far-reaching ripple effect of climate resilience, sustainable income, health, education, environment, productivity and safety for millions. Since 2010, we have built a network of 3000 inspiring Solar Sisters who have provided affordable, world class solar lighting, connectivity and clean cooking solutions to over 1.3 million people. Climate Change needs behavior change, which needs women. Women disproportionately bear the burden of extreme energy poverty and climate change. Solar Sister believes women are a key part of a climate solution for all. This is why we invest in women’s enterprise in off-grid communities. Through women’s leadership, personal testimonies and social networks, we bring transformational solar and clean cooking solutions to those not being reached by business-as-usual energy models. Centering local women in last mile clean energy access is essential for lasting behavior change, and clean technology adoption. Local women are enterprising, creative, hard working, and committed to improving the wellbeing of their families and communities. They are trusted. Women like Nanbet, a formidable woman raising five children on her own. A farmer and Solar Sister entrepreneur in Nigeria, Nanbet sells solar lights and clean stoves in her community and uses the profits to pay for fertilizers and laborers for her farm and to send her grandchildren to school. Solar Sister’s goal is to transition energy poor populations from the use of harmful, expensive, and archaic energy solutions to environment friendly, affordable and efficient climate friendly solutions. The good news is that tremendous strides have been made in clean energy technologies, spanning solar and clean cooking solutions, that hold the possibility of truly democratizing sustainable energy access. The challenge is lack of reliable access points for the underserved, lack of consumer trust in available solutions, and limited options for quality after sales service. Current models for last mile technology distribution are limited, sporadic, and unreliable - donated solar goods, which have no system for long-term sustainability or reliable follow-up when equipment breaks; pay-by-month models which are challenging for rural families with seasonal, agricultural incomes and are ultimately more expensive and are therefore marketed only to mid-tier customers, not the rural poor. 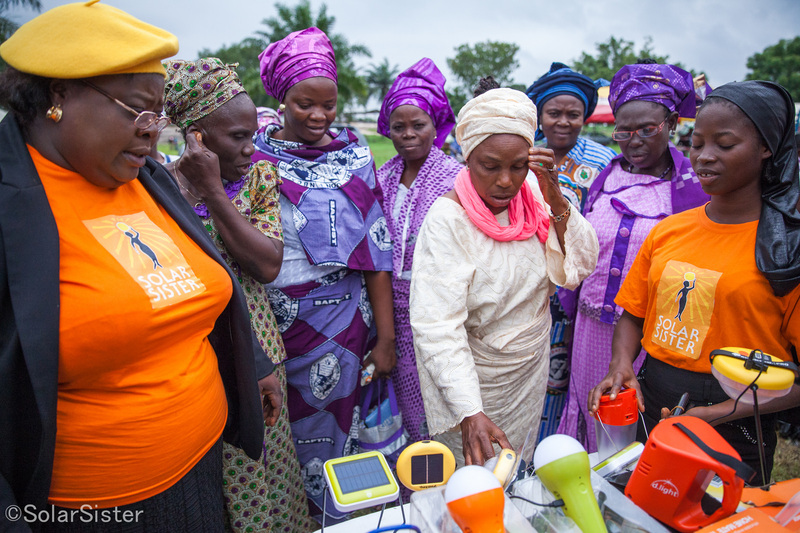 Solar Sister taps rural African women’s trust networks to educate communities about the availability and benefits of world class solar lighting, mobile connectivity and clean cooking solutions at their doorsteps. We give women access to technology, skills and confidence to succeed as grassroots clean energy entrepreneurs and role models. Since 2010, we have successfully built a network of 3000 Solar Sister Entrepreneurs who have delivered clean energy to over 1.3 people in Nigeria, Tanzania and Uganda. A 2016 impact assessment by the International Center for Research on Women found that Solar Sister is empowering women, increasing their income and making communities safer through clean energy access. 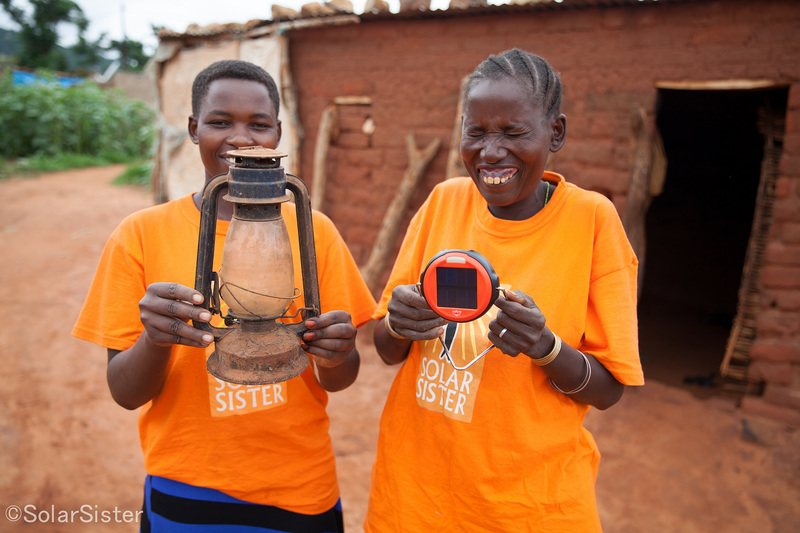 In 2017, Santa Clara University released its action research “Turning on the lights - Transcending Energy Poverty Through the Power of Women Entrepreneurs.” The study found that “..trust-based social networks are one of the main reasons participants chose to purchase their solar-powered lanterns from Solar Sister.” In 2018, MIT released its Solar Sister assessment ‘Reaching the Last-Mile: Women’s Social and Sustainable Energy Entrepreneurship.” The study sheds light on customer preferences and found that last-mile customers are more concerned with the social aspects of a purchase, such as whether after-sales service is available locally and whether their salesperson is familiar and trusted, validating Solar Sister’s unique women driven approach to improve clean energy access. Solar Sister has pioneered the world’s first women-centered scalable solution to energy poverty. We target underserved communities not being reached by majority of current energy access programs. We build local women’s leadership, market access and capacity which is vital for sustainability of energy access and climate resilience efforts. Our work is crucial to the economic, social, and moral imperative to eradicate energy poverty by: a) engaging, inspiring and empowering women to become leaders advancing renewable energy, climate change, and energy security solutions; and, b) providing world class “First Light, Last Mile,” which means we work to deliver solutions to the hardest to reach communities. 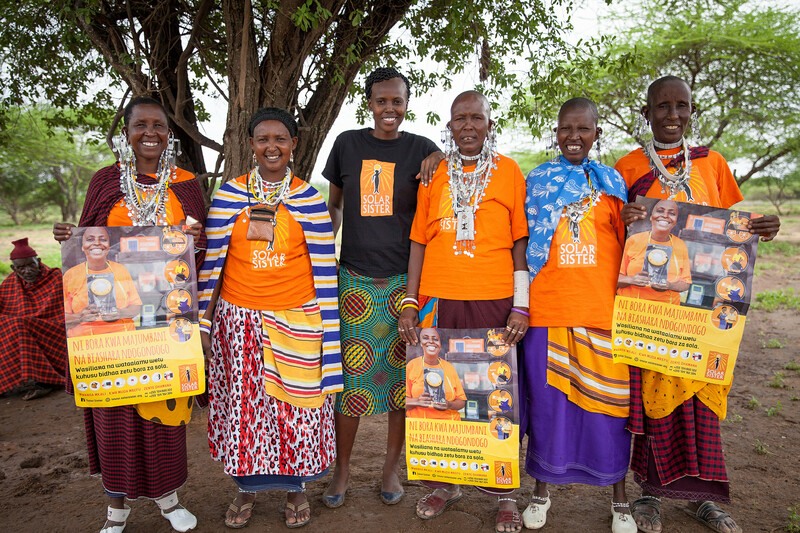 In January 2016, we launched our flagship Women+ Energy: WE Shine campaign to raise awareness of women’s role in the energy value chain by highlighting Solar Sister entrepreneurs and their impact. The campaign has successfully achieved the goal of reaching 5 million people in Tanzania through powerful and inspiring stories of women renewable energy entrepreneurs making a positive change in their communities. We are now scaling the campaign in Nigeria as well. Some of the key factors that have contributed to our success so far are: 1.We are a role model, women led initiative 2.We deliver energy justice for the most last-mile communities. 3.We excel at women’s renewable energy leadership 4.We are locally led and run 5.We show that behavior change needs trust. 6.Leading global research institutions have validated our impact 7.We create intergenerational impact with Solar Sister role models 8.Initiatives across the world have replicated our innovation 9.Our every dollar invested generates six dollars in social return 10.Our model is environmentally conscious beyond products we sell. We are addressing obstacles related to systemic barriers to women entrepreneur’s access to clean energy technologies, finance and skills. Solar Sister is a global leader in gender inclusive, market-driven renewable energy transformation. Our partner ecosystem plays a key role in growing our impact, and includes – Technology partners – d.light, Greenlight planet, Omnivoltaic, Philips Lighting, Envirofit, Toyola Institutional partners – World Bank and International Financial Corporation’s Lighting Global Program, Solar Nigeria program, UN Foundation’s Energy Access Practitioner Network, Climate Action Network –Tanzania, Tanzania Renewable Energy Agency, ENERGIA International Network on Gender and Sustainable Energy Grassroots Partners – Local village savings associations, African Wildlife Foundation, Women for Women International, BRAC, Mercy Corps, Caritas Advocacy Partners - Khanga Rue Media, Power for All initiative, Show the Good, Ripple Effect Images, UN Climate Change newsroom, Women’s Earth and Climate Action Network Our work has an impact on each of the three pillars of the Global Goals for Sustainable Development to end poverty, combat climate change and fight injustice and inequality. In addition to the partners listed above, we collaborate with policymakers, implementers and donors at the intersection of multiple Sustainable Development Goals. In the past five years, we have been a global influencer through a ripple effect of Solar Sister inspired initiatives across Latin America, Asia and Africa that have benefitted from our mentoring, best practices, advocacy and role models. Santa Clara University’s 2017 study found that - 1. 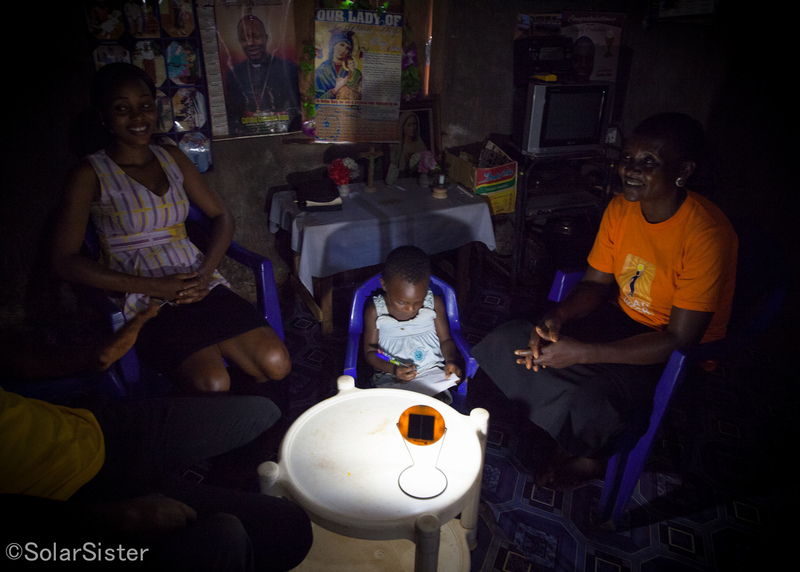 91.6% of Solar Sister customers interviewed stopped using kerosene for lighting, 2. Respondents report 170% increase in using lighting after sunset, 3. 53.7% households used money saved to pay for food and water, 4. New businesses due to solar lighting enjoyed more than 100 % weekly income increase. 5. At the household level, kerosene savings increased families’ investments in food/water (54%), education (31%), and household goods (14%). 6. Positive impact on productive activities like animal husbandry, artisanal activities, farming, retail and making/ selling food and drinks Solar Sister entrepreneurs report gains in skills and income from distributing solar and clean cooking solutions that improved their socio-economic conditions. These include improvements in their ability to save (94% of our SSEs save a portion of their monthly income), better business skills, and women’s agency within their families and communities. Solar Sister’s innovative approach addresses the interlinked issues of gender equality, sustainable energy, poverty and climate change. By recruiting, training, and mentoring women from local communities. Solar Sister bridges the knowledge and market access gaps which hinder renewable energy adoption at scale. Women's connections and first-hand testimonies as users enable them to influence behavior change and choices that communities must make to leapfrog to a sustainable future. Solar and clean cooking solutions delivered by Solar Sister since 2010 will mitigate 363369 tons of carbon dioxide (CO2) emissions over their 10-year lifespan. End users also reduce time and burden of securing energy resources (including fuelwood) and expenditures on kerosene, cooking fuel, and mobile charging. Intergenerational impact - In pastoralist Maasai communities of Tanzania, Solar Sister Julieth Molel benefit from improved income, improved environment and health, while also being a role model for young girls like her granddaughter Ritah who wants to be a scientist. Julieth paid Ritah’s school fees through her Solar Sister earnings. Education – In Santa Clara University study, 90.6% of off-grid parents reported that their children’s academic performance had improved since their households starting using solar lighting. 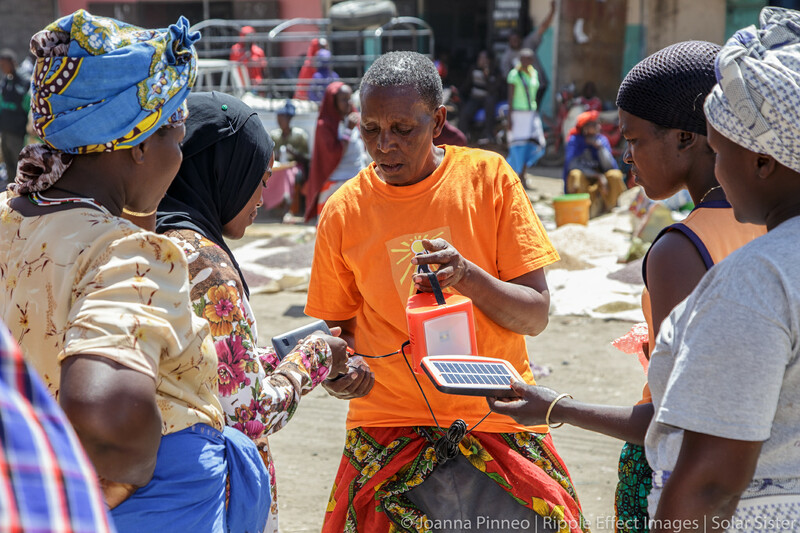 Financial resilience - As a result of solar lighting use and kerosene savings, customers report increased control over their financial decisions. Solar Sister customer Pascalina Aloyca was able to join a savings group. Women’s Status - One of the many voices exemplifying the impact of solar lighting in Santa Clara University study, Rodensia Elibarick states that due to her use of solar lanterns, her community views her as one of the women who dares to do big things. Solar Sister is using a blended approach to build a scalable and sustainable clean energy business. We have a diverse revenue stream that uses both an earned income and philanthropic capital to grow impact. This blended financing matches the hybrid nature of Solar Sister’s operations, which are divided into two impact areas: 1) core distribution business, delivering clean energy goods and services to last mile customers, and 2) activities that promote women’s economic empowerment through training and talent development, advocacy, research and innovation. As a social enterprise, Solar Sister uses a market-driven approach, combining donor investment and earned revenues from product sales to reach the most people at the least cost. Currently, for every dollar invested in our entrepreneurship model, Solar Sister generates $6.22 of Social Return on Investment. The SROI is calculated based on three core indicators: entrepreneur profits, customer savings, and carbon credits. Solar Sister’s SROI has almost doubled since 2015. This growth is largely due to selling higher quantities of clean energy products in a more cost-effective manner. From 2015 to 2017, Solar Sister increased products sold by 53% and also decreased costs of distribution.